The story in Montreal has been Victor Mete; Kailer Yamamoto surprised everybody by starting the season with the Edmonton Oilers as an 18-year-old; while Jake Virtanen and Brock Boeser have stolen most of the headlines in Vancouver. 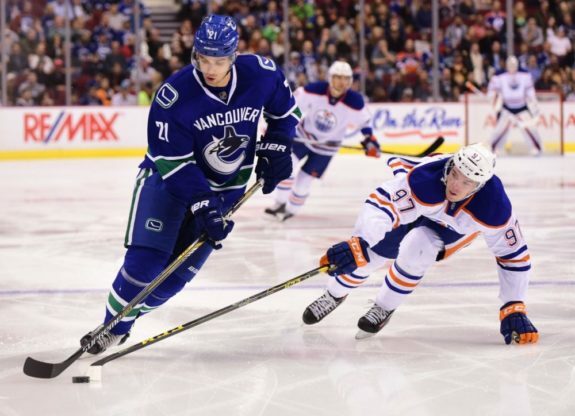 Even though all the eyes are on the youngsters, the fate of the Canucks hinges on some of the veteran players. Virtanen and Boeser are going to draw a lot of attention from fans and media, but they won’t determine the fate of this team. Until the likes of Bo Horvat, Boeser and the other young players become leaders on this team, the fate of the Canucks still rides on the shoulders of the veterans. That’s the reason why many are predicting such a lowly finish for the Canucks, because not much is expected of the older players. Oddly enough, some of those veterans are the least-talked about players in camp. For now, the Sedin twins remain Canucks. They’ve made headlines more than some of the other veterans because, well, they’re the Sedins. The twins jumped ahead of the headlines by penning a piece in The Players Tribune regarding their future. Basically, the twins have put any whispers surrounding a trade to rest. Vancouver is their home, and they have no intention of leaving. Although teams often try to offload veterans, the eternally classy Sedins have earned their right to stay. The discussion at every training camp isn’t so much about the Sedins but who they will play with. Markus Granlund is the consensus choice among media and fans, but head coach Travis Green has also tried Sam Gagner, Boeser, and Thomas Vanek on their line. There was one notable player who didn’t sniff any action on their line during the preseason. Perhaps the most under-discussed story of the preseason is where the Canucks third-highest paid player fits on this team. Loui Eriksson sure didn’t play like a $6 million man last year with only 11 goals and 24 points in 65 games.To put his terrible season into perspective, Eriksson only had one more even-strength goal (six) than Jack Skille last year, despite playing in ten more games. Eriksson went through the same struggles when he was with the Boston Bruins the season after being traded for Tyler Seguin. He struggled initially with 10 goals and 37 points in 61 games. Eriksson bounced back the following year with 22 goals and 47 points, although it’s worth noting that Eriksson played in 20 more games during his second season in Boston. Expecting a bounce-back from Eriksson is reasonable, but how much better can he be? Most of that will depend on deployment. As of right now, he looks to be squeezed out of the top-six by youngsters Sven Baertschi and Boeser. That will hurt his ability to improve because he will be hard-pressed to regain his form on a third line, even if Green evenly distributes his forwards minutes. Imagine if Eriksson and Vanek were part of your bottom-six five years ago when they were in their prime? That wouldn’t have happened in a salary cap era. 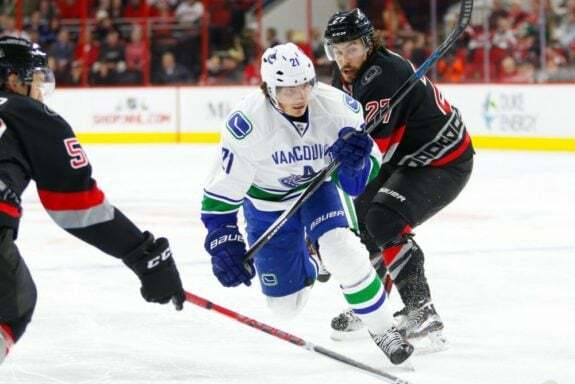 Instead, the Canucks have Eriksson and Vanek years past their prime and management must be hoping that they can squeeze some extra offence out of the wingers while their prospects marinate in the minors. The two wingers also provide a veteran presence so that other prospects aren’t thrown into the NHL before they are ready. Most of the talk about Vanek so far regards his lack of foot speed. When Vanek played with the Sedins in the preseason, the line looked like they were in quicksand. That won’t fly against faster Pacific Division teams like the Oilers or the Arizona Coyotes. Perhaps there should be more talk about Sutter after he just finished his first full season as a Canuck. Sutter managed 17 goals despite playing with a nagging wrist injury. Brandon Sutter likely won’t average 19 minutes per game under Travis Green. While that looks good on the surface, Sutter also played on the first-unit power play and averaged almost 19 minutes per game. He was over-utilized by former head coach Willie Desjardins on many occasions because he was a “safe” player. His stats look good on the penalty kill and in the face-off circle, but his even-strength and power play stats warrant fourth-line consideration. That’s exactly where Sutter finds himself as we creep closer to the regular season. Green wants Sutter in more of a shutdown role, which is why he might centre the fourth-line. If players on the top three lines can outscore Sutter, the Canucks could be in better shape than most think. 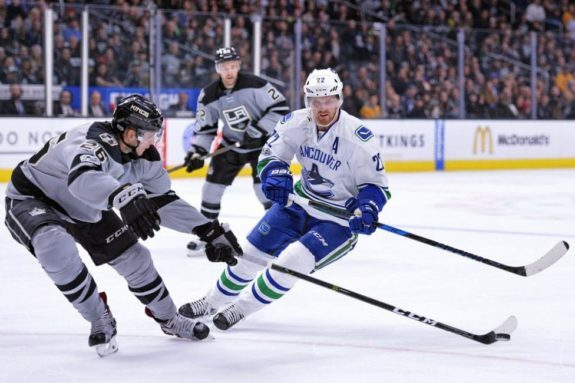 Even though Sutter is in a fourth line role, his performance, along with the performances of the veterans above, will determine the fate of the Canucks season. It’s not likely that all these players exceed expectations this year, but that’s probably what the Canucks will need if they’re going to be competitive. Asking for bounce-back seasons from four players who are past their prime is a tall ask. Then there’s Sutter, who’s never had more than 40 points in a season. For better or for worse, the performance of the veterans will have a major factor on the Canucks’ season.